Check out this interview with Lilian Thuram, conducted by Pierce Freelon via Blackademics. I stumbled onto this exploring the website generated by Professor Lauren Dubois's course on World Cup politics. Amazingly, Thuram was in residence at Duke as a part of this course. Cheers to Blackademics. And Dubois's course site is really neat, but it looks like the class could have done a lot more vis a vis women. Given the smart, politically engaged interviews Thuram offers, I wish someone would ask him about recent campaigns regarding homophobia, or, even better, I wish someone would raise the issue of Eudy Simelane's murder to ask if male footballers had thought about working with FIFA around the South Africa World Cup to make some sort of statement against the sexist and homophobic violence directed against black lesbians there. But, hey, that's moi, asking for la lune. Iraq's victory over Saudi Arabia in the 2007 Asia Cup final is likely to hold up as one the decade's most significant wins. The team's victory represented a complex distillation of resistance and anger. The torture and murder of Iraqi athletes is frequently cited in the litany of horrors suffered by the Iraqi people at the hands of Saddam Hussein (see this 2003 Sports Illustrated story). Responding to allegations of torture in the country's soccer program, in 1997, FIFA investigated the architect of Iraq's athletics program, Uday Hussein, but spoke only with his people and wrote a report exonerating the sadist. Interest in the plight of the country's people has long been guided by questions of political expediency. These athletes know intimately what it is to have one's body enlisted in the service of the state, and are wary at best about having their experiences drafted into discourse defending the US invasion and occupation of Iraq. On winning the cup, while a frantic official stood next to him shouting, "No Politics! No Politics," captain Younis Mahmoud said, simply: "I want America out of Iraq now!" Drawn to the team by the Asia Cup victory and the captain's powerful statement, in 2007, Indian artist Riyas Komu went to watch one of Iraq's World Cup qualifying matches. Click here to read the rest of my latest Art21 post about Komu's work, and to see more examples of the pieces inspired by his work with the Iraqi team. I lost a few days to travel - a flight from Bombay to Kolkata was so badly delayed that the event I was going to attend and report on (the Indian Football Player's Association annual dinner) was over by the time I got there. All was not lost, because I got to hang out a little with the country's player of the year, Subrata Paul. He was remarkably zen as the hours ticked by at the airport and it became increasingly clear that both of our trips to Kolkata were going to be somewhat pointless (well, he has family & friends there). Fresh from training camp in Goa, the Pune FC keeper confessed he was actually "very angry" but honestly, I could not tell this at all from his affect. Turns out he's been studying Yoga & philosophy for two years, in support of his football. He kept me from stressing out. We sat there pretty chilled out, while nearly fifty passengers threatened to riot. I wish I'd had him with me on the trip back to Bombay. That plane was diverted to Pune, for no clear reason, and we were left to sit on the runway for nearly four hours. I'll write more about my trip later, but for now I just wanted to share this: I had joked to someone that my trip to Kolkata was all about learning what away games must be like in India. I was kidding, because, well, flight delays happen everywhere. But the morning after I got back, I saw this story: India sent their U23 team to the SAFF cup tournament in Bangladesh. They won. Great news! Their flight home was cancelled, they got stuck there overnight and then the airline lost the team's luggage. 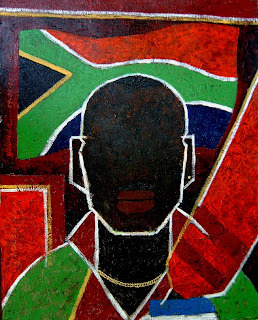 The above is not a portrait of a footballer, clearly, but rather the West Indian cricket player [Brian] Lara. The painting is by Goan artist Yolanda Sousa Hammermeier. I love it, just for the colors & graphic sensibilities. She's also done fantastic paintings in response to 2002 World Cup matches. Turns out she made headlines in the late 70s and (very) early 80s as a prolific striker - I came across her name as I was looking for women footballers in Goa, and was thrilled to learn she was also an artist. We had a fantastic conversation last week. I write about her football paintings here: Players Painting. She recalled playing against a US team in the 1981 pre-FIFA women's world cup - she said she thought they were all, like, 15. I believe that was the tournament in which she said India started off with an amazing 2-2 result against Germany - the women partied all night to celebrate and basically got destroyed in the next match. "Our coach wasn't used to winning," she said. She's always painted, made art, and until a knee injury sidelined her, played soccer. Sport & art have had a fluid relationship in her life, a relationship now sustained on canvas. This is her lovely portrait of Turkish keeper Reçber, who just had a fantastic game playing for his club side Besiktas - against Man U at home (0-1). 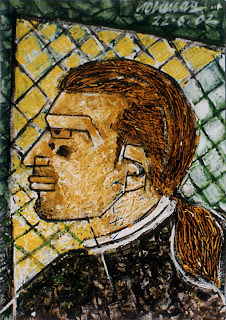 Athletes & Artists: Riyas Komu's "Mark Him"
Just wrote my first dispatch on art and football, inspired by Riyas Komu's work: Athletes & Artists: Riyas Komu's "Mark Him (First Half). " The above is a portrait of Mehrajuddin Wadoo. Mehrajuddin is an Indian National Team midfielder, and currently plays for East Bengal. He's from Kashmir, and you can read a lovely interview with him at Goal.com: It Is Never Easy to Win the SAAFF Cup. I write this from Goa, just minutes before heading to a meeting with the Indian National Football Team. This is part of a research trip to India, to explore the work and practice of the artist Riyas Komu. Komu has been meditating on football for a few years now, and is as passionate a fan of the sport as I've met - and is particularly committed to the sport in India. I'll be posting articles about this trip on Art21 - and will announce those posts and link to them here. 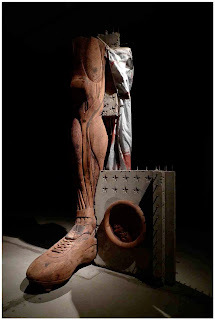 Above is one of a series of his "left leg" sculptures - carved from salvaged wood, cut through with slabs of concrete and steel cable. When I first saw one of these sculptures, I said "He plays." I knew with total certainty that the artist was a player because these pieces are phenomenologically real - meaning, they look like how a player's leg sometimes feels. Both heroic and traumatized. More soon!